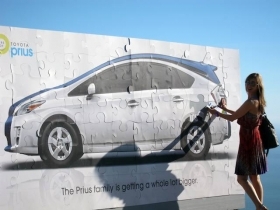 Toyota has teased the forthcoming Prius on facebook. Toyota Motor Corp., continuing to recover from a recall crisis, plans a new national advertising campaign for the Toyota brand that will highlight safety. Don Esmond, senior vice president of automotive operations for Toyota's U.S. sales arm, said today that the new advertising will highlight quality, reliability, dependability and safety while targeting consumers who don't own a Toyota. The spots will debut by the end of the year. Toyota has taken several steps to rebound from the recall of millions of Toyota and Lexus models over unintended acceleration. It has made a package of five computer-controlled braking and vehicle stability technologies standard across all models and will make a brake override system standard on all new models by the end of the year. The company also has formed teams of 200 engineers to identify and investigate reports of unintended acceleration and appointed a chief quality officer and chief safety executive in North America. Toyota's star safety system -- consisting of standard antilock brakes, traction control, electronic stability control and other equipment -- has been heavily advertised nationally for months now. Industry light-vehicle sales have jumped 10 percent this year, but Toyota has been forced to raise incentives to attract customers in the wake of the recall. The automaker is also facing stiffer competition from rivals -- notably, Hyundai, Ford and Nissan. Toyota Group's U.S. sales are up 1 percent this year, with Toyota brand volume up 1 percent, Lexus sales up 9 percent and the Scion subbrand off 30 percent, Esmond said. Toyota has completed repairs on nearly 5 million vehicles -- or more than 80 percent of the vehicles recalled -- for sticky pedals and other safety issues. Esmond said the repairs include more than 80 percent of vehicles recalled for sticking pedals and more than 85 percent of Prius and Lexus HS models subject to an antilock-brake recall. Toyota research shows that customers with recalled vehicles are more loyal to the brand now than customers with vehicles not subject to a recall, Esmond said. In other developments, Esmond said the next member of the Prius lineup will be introduced at the 2011 North American International Auto Show in Detroit. At a recent meeting with dealers, Toyota showed two new Prius models -- one smaller and one larger than the current Prius. Toyota has begun introducing the new Prius model -- resembling a small microvan -- with teaser images on facebook. He also endorsed struggling Scion, whose sales have suffered with the introduction of rival models from Nissan and Kia. Toyota expects the brand to rebound with a new tC coupe and other changes. Early next year, Scion will introduce a new premium microcompact called the iQ. It measures less than 10 feet and will be the world's smallest four-seater, Esmond said.